Last week on wildlife Wednesday we talked about the biggest type of anteater, the giant anteater. This week we're going to talk about the smallest one, the silky anteater! They grow to about about 7 inches in length. Silky anteaters have a prehensile tail. Silky anteaters live in trees and hardly ever descend to the ground. Silky anteaters have 2 big curved claws on each of their forefeet. They use them to hold hold on to tree branches and for defense. 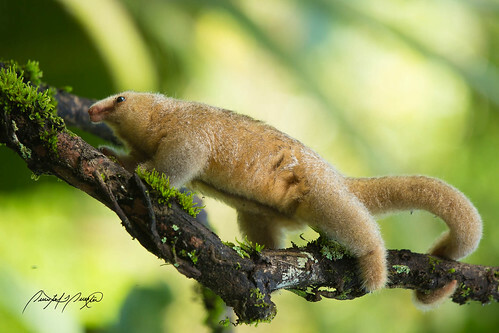 When defending themselves silky anteaters stand on their hind legs and grip the tree branch with their hind feet and tail and lash out with their claws. Silky anteaters have poor vision but excellent hearing and smell. Silky anteaters can eat 800-5000 ants in a day. Unlike the other anteater species the silky anteater has a short snout. What do you think of this little critter? I think they're adorable. I had no idea there was an anteater this small until I started researching anteaters.